Another milestone has been achieved in the College's Arizona presence. The Education Committee of the Arizona State Board of Nursing has recommended approval for our nursing programs in the Phoenix metro area, which are tentatively scheduled to start next spring. 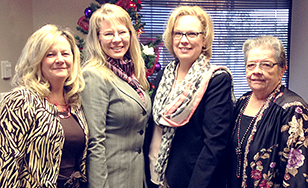 From left, program leaders Carolyn Robinson, graduate nursing professor; Maria Laughner, regional director of the Arizona campus; Julie Anderson, dean of the School of Nursing; and Cecelia Taylor, healthcare education liaison, met with the board of nursing. For more information contact Laughner at (623) 694-0984 mlaughner@css.edu. Stay tuned for future developments as our Arizona campus continues to grow.